Back at SXSW, Neil Young talked about a new media compression algorithm that keeps a lot more of the music at a comparable filesize. The Pono music system allows you to listen to music at a higher fidelity than even 320 kbps MP3 files. I got to talk with the folks at Pono while at CES 2015 and check out the player itself. 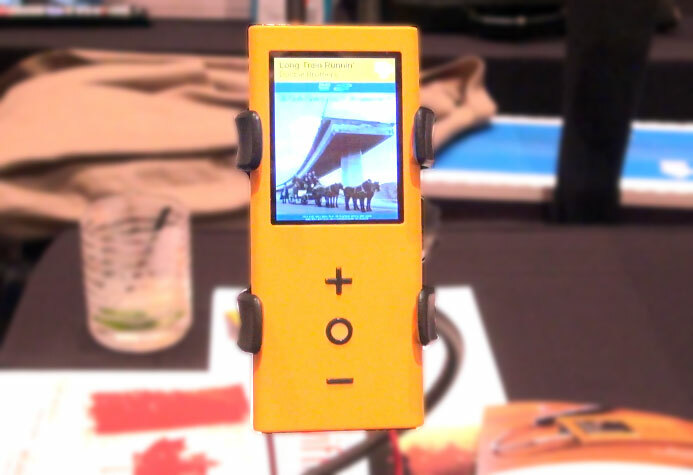 The Pono player itself looks pretty simple but big. Inside is 64 GB for storage with a removable 64 GB card slot for more music and albums. It has two 3.5 mm jack options – one for headphones and one for high quality stereo output. This system could give you at least 5,000 songs on your player at any given time. From the high-fidelity Pono FLAC system, to mp3 files you already have. Therefore you can compare your MP3 version to the Pono algorithm. You can also listen to AAC, AIF, and WAV files without conversion. If you are concerned that its another device to carry around, Pono has been working with 3rd parties to get the technology within other devices. Therefore you can listen via your computer, smartphone or tablet in the future.